The new interior concept shows the bare concrete structure, optimizing the spatial qualities of the rigid post-war office building. Glass meeting rooms structure the open office area and the lounge and pantry areas bring a splash of colour to the office floors. The selection of colours and patterns is inspired by the prevailing colours of the ’50. The 7th floor is shared as a special project environment with meeting rooms and touchdowns. The richness in culture of “Stadsdeel Nieuw-West” is especially portrayed in the graphics and signing. 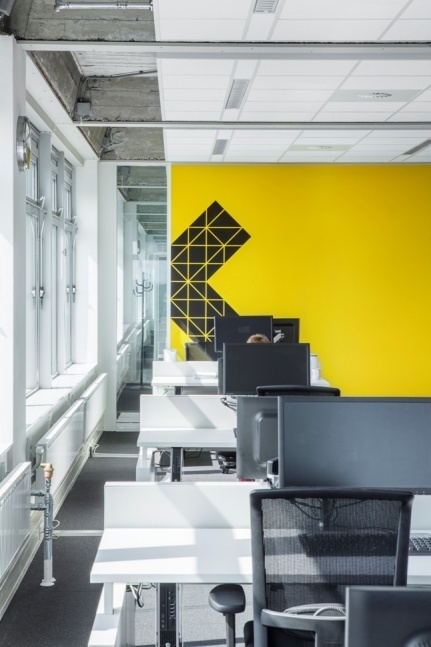 The unobstructed view from the modest offices almost invites the colourful Stadsdeel into the daily practice of the employees. Office Size: 9000 sq. ft.